Introducing our Original Washed Blue Full Lined KEVLAR® fibre Jeans. For three years we have tried & tested many combinations of KEVLAR® jeans, never releasing batches to the public as its safety standards, cut & looks where not appropriate for our customers. 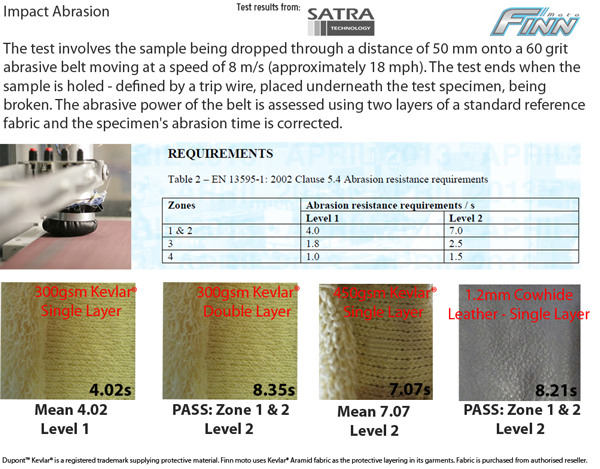 After meeting a manufacture with the same mind set & experience we slowly went over & perfected each aspect of our KEVLAR® jeans insuring the pants meet & exceed a vast range of motorcyclist’s needs & wants. This internal R&D cost us a lot of time & money, for such a personalised item we wanted to make sure even the high demanding consumer was pleased, so we made these pants strictly to performance, comfort & looks. Only the highest quality materials & stitchers are used; we even got our own KEVLAR® batch made up to our specifications because the options available in the market did not satisfy our safety standards. These beautiful blue indigo washed denim jeans easily passes the biker looking for a casual look with a wash effect to give a hint of character suiting most tastes. Making them the perfect all rounder. Straight out of the packet these jeans have a soft touch, so you can slide in them with ease and get on with your day. I got these online with the Hoodie and Both are great quality and fits great. Jeans are comfortable and fit well in my regular size over shin high riding boots. Ordered hip padding and they slide into the Velcro pockets without issue. Confident these will protect me in a down which I'll undoubtedly encounter soon on my L's. I have two pairs of the 500gsm Kevlar jeans and bought these because they offered a highlevel of comfort, protection and value for money. I am not one for buying riding jeans with kevlar at the knees, rear etc. When you have a slide there is no guaratntee how or where you will slide. Recently rounding a corner at about 55kmh I hit a wallaby and slid about 15 metres on a surfaced road running through a national park, read "rough surface". My gear, which included the jeans did its job perfectly and as a result of the slide I came out without a scratch, except for a slight foot spraindue to the weight of the bike on my boots. Would I buy these jeans again? The answer to that is yes as I have already done so and would not hesitate to recommend them. My Jeans arrived on time were a perfect fit and are very comfortable to wear, the quality is great, thanks guys for providing such a good service and high quality product. Top shelf pair of jeans! My 450 gram Kevlar jeans arrived today and I can't rate them high enough. Out of the bag they are true to the website colour that I ordered, have that already broken in feeling and importantly they just look good. I have personally had a gripe with protective jeans that make you look like you shop at Lowes, these I can attest to don't. No point just admiring the new purchase so I pulled them on (they fit true to the size chart) and went for a blast. Results are in, very comfortable and sit like a bike jean should. The armour in the knees is soon forgotten about but I don't know if I would have it in on a multi day ride. The jeans are reasonably "bulky" but protection with the 450 gram Kevlar has to add in that department and it's not noticeable when your wearing them. Recommend. My jeans just arrived today and took them out for a little ride. They are very heavy duty, the overall fit was perfect. I normally wear a size 34 in Wranglers but I ordered a size 36 and they fit perfectly. I also opted for the additional CE protection in the hips. Overall they are a very nice pair of armored jeans. I have visited several local shops near me and I have not seen anything close to the Quality that I received from Finn Moto. I would definitely buy again! They may be a little heavy in thick for summer riding but if you value your skin in the event of a crash these are perfect. 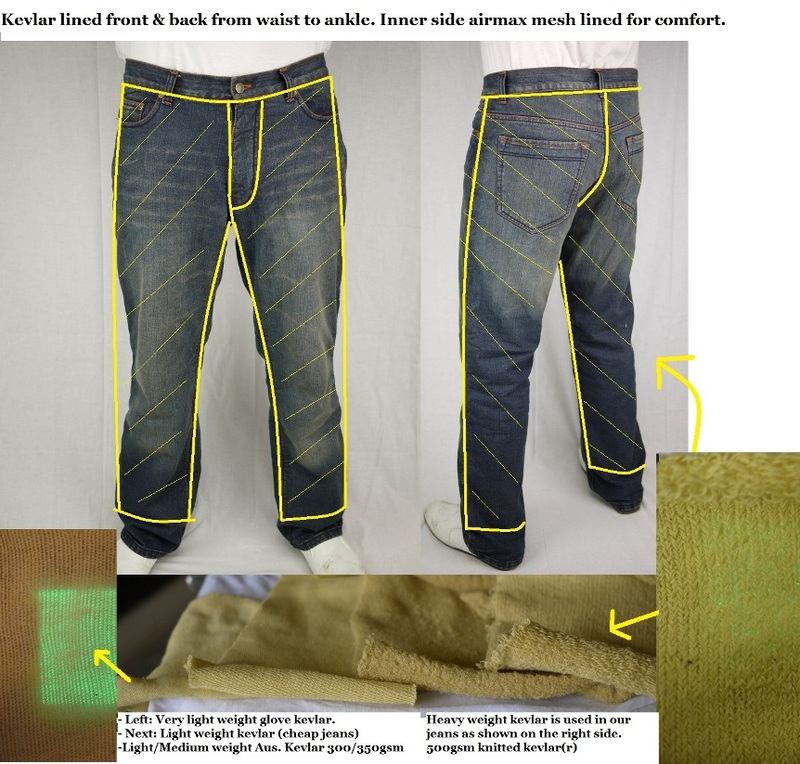 Thank you very much for providing a fully lined Kevlar jeans at a reasonable price. Message added by Finn Moto: Thank you David for your feedback. You did the right thing USA customers need to size up. eg if your normally 34 in USA jeans, choose our size 36 (best to cross reference your actual body waist measurement with our size chart). Australians the finn moto jeans run true to size; so if you normally wear 34 in standard jeans, you will fit into our size 34. Very comfortable and although I can feel the knee protectors, it doesn't bother me in any way. Jeans are great for winter riding, keeps you nice and warm. I was very happy with the variety of available sizes, as I have longer legs. Overall, good quality product and highly recommended. Brilliant product at a much better price than Draggin Jeans. Very comfortable fit, a high quality product. Would definitely purchase from Finn Moto again. The jeans are comfortable and I like to thank the people at Finn Moto for taking the time to ensure a good fit. I purchased a pair for my wife and she lives them too. Got my 450 gram Kevlar jeans the other day and took them straight up the Castlereagh hwy to Mudgee. Didn't bother changing to go out that night cause they were so comfy and warm. I recieved the jeans 10 min before a planned long ride , I quickly changed and rode for 3 hours. Other than being a little thicker than regular jeans , the were just as comfortable as my daily Levi's ! The fit was good, just enough stretch for comfortable riding, good air flow and high confidence from wearing 450 gsm Kevlar knowing my skin would be spared in case of an unlucky event. Well worth the price . Highly recommend, spend the money and save your skin.